Wow. 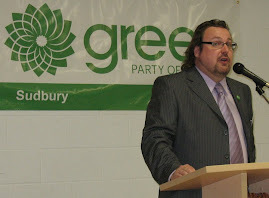 Greater Sudbury's Ward 5 Councillor needs to resign. Apologize first, and then resign. His bullying and casual accusations of illegal behaviour directed against those who oppose his own personal vision of development in the City has to come to an end. The City and rogue Councillor Robert Kirwan have really upped the rhetoric about the Downtown BIA's intention to appeal the Kingsway development decisions. Late last night, Councillor Kirwan accused the BIA of engaging in illegal activity - an accusation that is not supported by a shred of evidence. Yes, let me repeat that. His assertion that the BIA's is engaging in illegal activity have to do with the action the BIA is taking to file an appeal as part of the public process related to the development applications recently endorsed by Council. I note that a lawyer, Mr. Gordon Petch - an officer of the Court, someone who has been called to the bar and whom has represented numerous community groups, individuals and municipalities in front of the Ontario Municipal Board - filed the appeal on behalf of the BIA. Clearly, Mr. Petch believed that they had a legal appeal. Now the appeal is with the City. Let's see what they do with it. Will they forward it to the Local Planning Appeals Tribunal (LPAT) in Toronto for action - if they do, that action seems to suggest that Councillor Kirwan really is engaged in a rogue action here by calling the BIA's actions "illegal". Or will they withhold the appeal, on the basis that the appellant could not file it - as is the Councillor's claim? I'm not a betting man, but if anyone wants to lay a wager on this, let me know - because the appeal will be forwarded to the LPAT. This appears to be where we're at today when members of the public decide to participate in a legislatively-required public process - facing public accusations of illegal activities. This is just egregious. 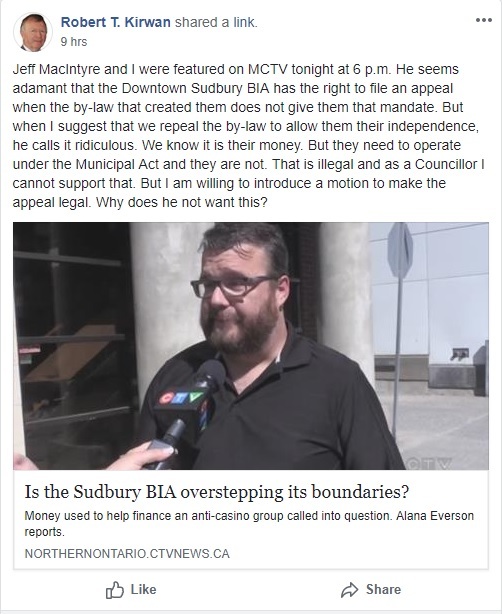 It's just not right, moral or ethical for a member of our elected Council to tar a local business association with an accusation of behaving in illegal manner while the BIA is participating in a public process. The Kingsway development applications still working their way through a required public process. It may be more than a year yet before that process comes to conclusion. Are members of the public and our City's business organizations going to have to deal with this kind of abuse from elected officials until these matters are concluded, as per the legislation? Councillor Kirwan needs to resign, now. He must apologize to the BIA for this baseless accusation. This is the last straw. His behaviour has become completely unacceptable. Others on Council need to stand up to this bully and fight for our BIA and downtown.